Things are looking much brighter for one of Marvel Comics' grimmest characters. While critics have torn Venom limb from goop-covered limb, the moviegoing masses appear to be really digging the film, having unexpectedly sent the movie's audience approval rating soaring. When Venom slithered its slimy body onto the silver screen at the start of October, critics weren't exactly loving what the symbiote and its disgraced investigative journalist host (Tom Hardy's Eddie Brock) had to offer. The select group of industry insiders who attended the film's world premiere in Los Angeles on October 1, a few days ahead of its October 5 release, seemed split on how to feel about the not-quite-a-superhero superhero flick. Eddie's relationship with Venom was a highlight for some, as were the unintentionally hilarious parts of the script, but the inconsistent tone and failure to follow through on its more interesting elements were major points of contention. At the end of the day, many chalked Venom up to being a middle-of-the-road movie that wasn't necessarily good or bad, but just was. The minute Sony Pictures lifted the embargo on full reviews, however, critics were singing a much different, far harsher tune. Venom has sputtered to a paltry 32 percent critical approval rating on Rotten Tomatoes since reviews rolled out, meaning the Ruben Fleischer-directed affair is a certified stinker according to the review aggregator's standards. 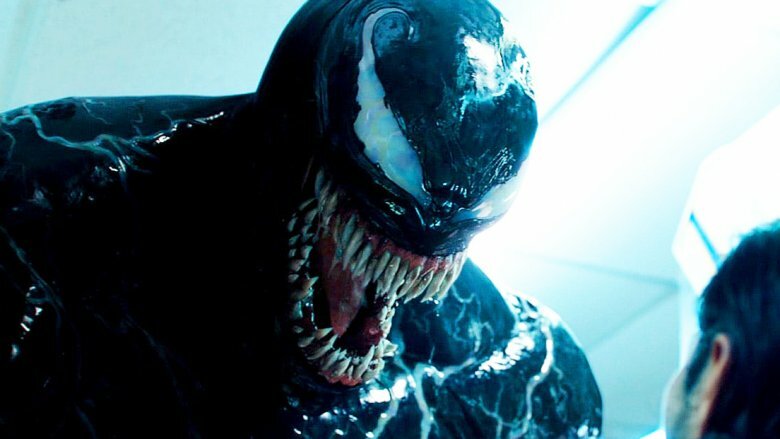 One writer slammed Venom as "a tone-deaf, uneven, and maddeningly dumb clunker that never settles on an identity," while another ripped it to shreds in writing that the film is "a chaotic, unfocused, assembly edit of a movie, that appears to have had all the vitality and humanity parasitically sucked out of it." Yikes. Out of 187 accounted-for reviews, just 59 are positive at the time of this writing, leaving everyone to write Venom off as exactly what it seems based on its critical consensus: "like the comics character in all the wrong ways — chaotic, noisy, and in desperate need of a stronger attachment to Spider-Man." But wait a hot second — that 32 percent score and that bleak majority opinion only account for critics' thoughts on Venom. They don't represent what the general public thinks of the film. Though critics and casual audiences don't always come to the same conclusion regarding the quality of a film, Venom is a unique case, as there's a significant disparity between reviewers and moviegoers' attitudes toward the movie. As of Sunday, October 7, Venom touts a surprisingly stellar 89 percent audience approval score on Rotten Tomatoes. The rating accounts for 16,000-plus votes, signaling that, after shelling out cash for tickets and a large popcorn with extra butter and sitting their butts in front of the screen for nearly two hours of insanity, that over 14,000 people logged onto Rotten Tomatoes and gave Venom a positive score. Since Rotten Tomatoes marks films and television shows as "Rotten" when "less than 60 percent of reviews … are positive," Venom got stamped with an unsavory "green splat" icon next to its Tomatometer score. On the flip side, the site labels movies and series as "Fresh" when "at least 60 percent of users" give "a star rating of 3.5 or higher." Because Venom currently sits at a 4.4 (out of 5) star rating from audiences, it has a "full popcorn bucket" icon displayed to the left of its audience score. How adorable. Though this sounds all well and good for Venom, it's crucial to remember that Rotten Tomatoes doesn't verify the audience score like it does with the critical score — which means that people can easily cheat the system. Take Kirk Cameron for example. In 2014, the actor-slash-Evangelical Christian was gearing up to release Saving Christmas, a pic that blended together two important parts of his life: comedy and faith. Critics lambasted the film upon its release in November of that year, calling it a "shoddy 80-minute feature that contains approximately 50 minutes of actual moving footage" and "the worst holiday movie ever made." Not a single review for Saving Christmas was positive, and Cameron apparently wasn't pleased. Hoping to boost the approval rating for Saving Christmas, Cameron shared a (now-deleted) post on Facebook asking his fans to "storm the gates of Rotten Tomatoes" and write positive reviews for the film. As CinemaBlend details, Saving Christmas' audience score soon rose to a shocking 94 percent — a figure close to the score the general public gave Venom — before Cameron's plan eventually backfired and the audience rating dropped down to 30 percent. Now, this isn't to say that there's some shady stuff happening here with Venom, but it is worth noting that the 89 percent audience score may not entirely reflect reality. What does reflect reality, however, is the CinemaScore audiences gave Venom: a B+ on a scale from A+ to F.
During a film's opening weekend, CinemaScore polls moviegoers immediately after screenings to gather insight about their thoughts on a particular release. CinemaScore provides audience members with a six-question ballot, which asks them to give a letter grade to the movie they just watched, with A+ being the top score and F being the lowest. A B+ score isn't necessarily anything to write home about – for perspective, Justice League and Spider-Man 3 both received a B+ from audiences when they debuted — but it does indicate that audiences enjoyed Venom a whole lot more than critics did. This is hardly the first instance in which critics and audiences have clashed over a movie's merits. Just last year, only 40 percent of 322 reviewers rated Justice League positively, while 74 percent of moviegoers enjoyed it. A similar sequence of events played out in 2016 with Suicide Squad: the critical score came in at 28 percent, but once audiences saw it for themselves, 60 percent of 143,468 Rotten Tomatoes users gave it a positive star rating. Perhaps the most infamous example of critics and fans disagreeing came in December 2017, when reviewers were the ones loving Rian Johnson's Star Wars: The Last Jedi (91 percent of 393 critics rated it well) and fans were hating it (only 45 percent of 201,084 users enjoyed the Skywalker saga installment). If Venom's audience approval score continues to soar, or even if it stays the same moving forward, Sony will likely take it as a sign to press on with its plans to turn Venom into a full-fledged franchise. Fingers — and fangs — crossed that the potential Venom sequel can right some of the wrongs of the original and manage to fare well with both critics and audiences.